Friday was the big day! 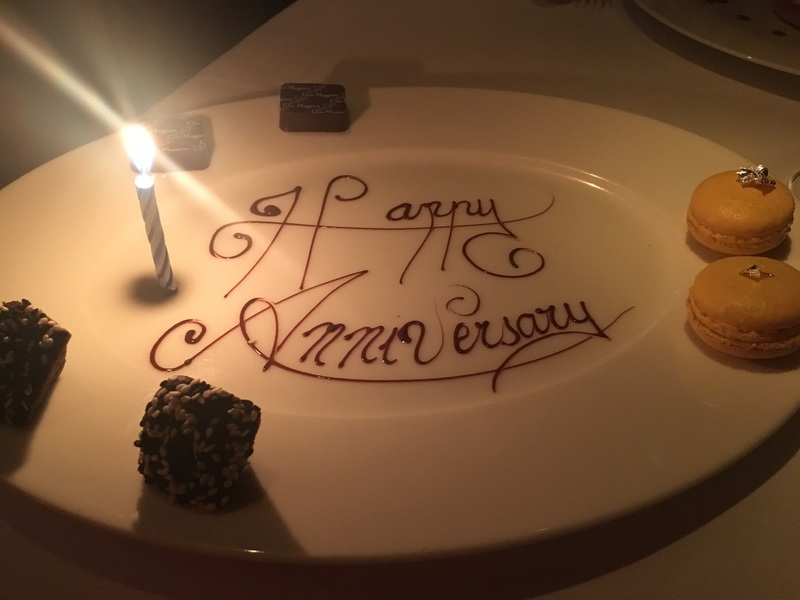 We made it to our second anniversary, and to celebrate we would be eating at the most romantic restaurant in the world. 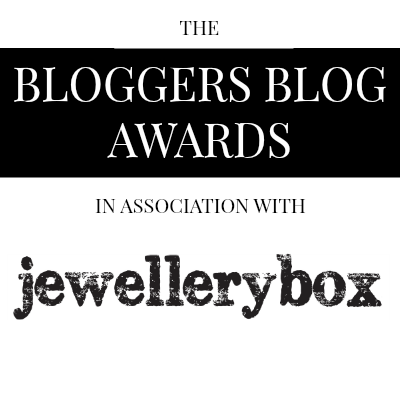 I haven’t just made that up, this restaurant was awarded it for 2016 by Architectural Digest. We booked our table a couple of weeks ago, with the only time remaining being 10.30pm. If you’re going to have dinner in style, you may as well get there in style so we ordered our Uber with plenty of time to spare but we were sat at our table straight away. We were told when we booked that there was no space remaining in the conservatory, this being what you see all over their website and social media. We did have a peak inside though – the branches and fairy lights filled the ceiling, with the fireplace giving the warmth and fantastically classy and cosy feel. However we would be sat just away from the bar with just three other tables in our room. 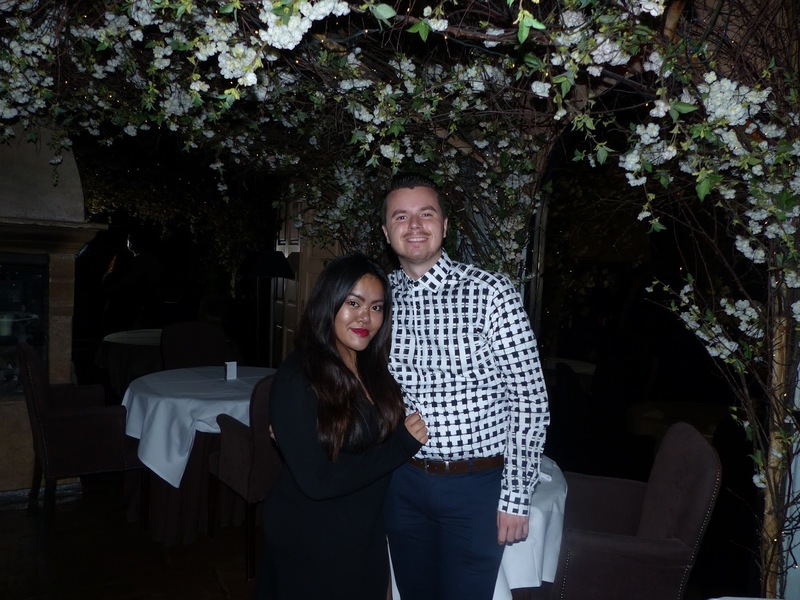 Even though it did not match up to the conservatory, the intimate feel meant it wasn’t hard to see how it’s regularly labelled the most romantic restaurant in London, and maybe even the world. We always knew this meal was going to come at a bit more of a cost than the usual, so we decided beforehand to go for a main, sides to share, and dessert. 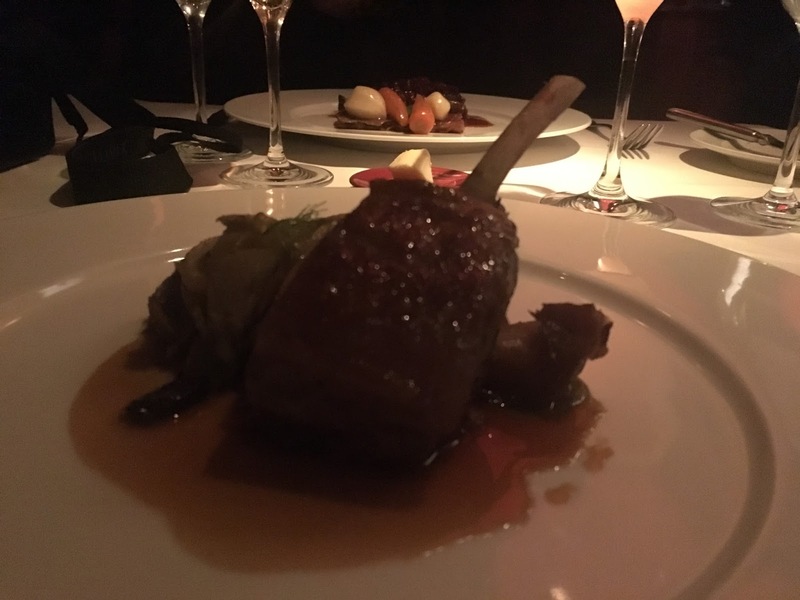 Whilst the pictures probably can’t do it justice (it was very dark in there and not great for bloggers), both of our main dishes were scrumptiously delicious. 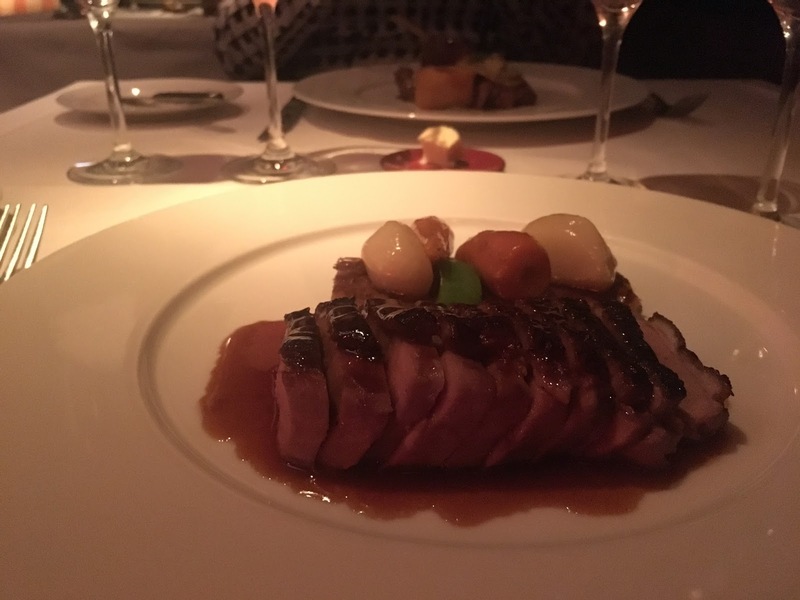 The meat was tender and complimented well by the other flavours on the plate. Upon our meals arriving at the table, first thoughts were always going to be the effort made to have it look attractive, rather than have our stomachs content. But in fairness, both were filling, but left us wanting more. What a shame we had to have a dessert. We shared a side of triple cooked chips, which we were however quite disappointed in. Whilst there was plenty of crunch on the outside, the inside was far too overcooked. However the other side of mashed potato was delightful and new for us, in the respect of the truffle flavour. 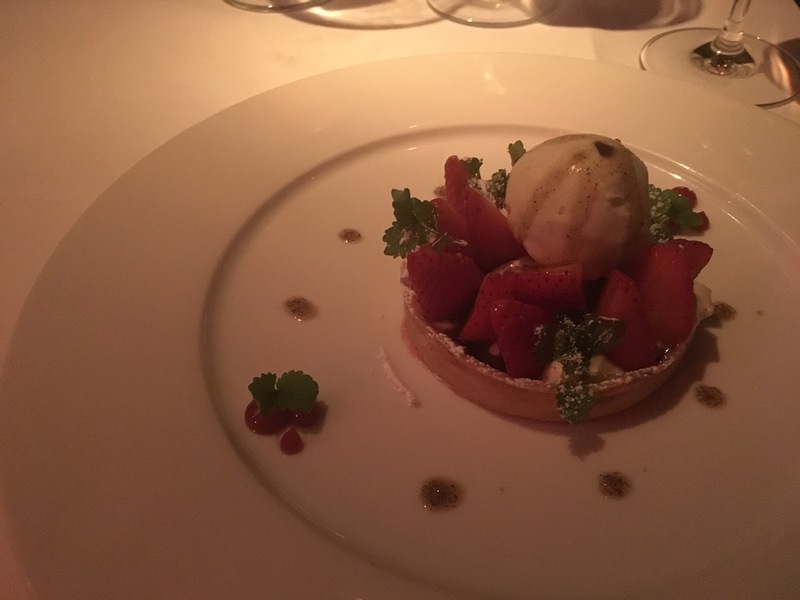 We both decided upon the same dessert which had its own unique feature of olive oil sorbet – sounds peculiar, but we had built trust from the previous course that it would take us by surprise. Its subtlety blended well with the strawberries and made to a very pleasant ending. 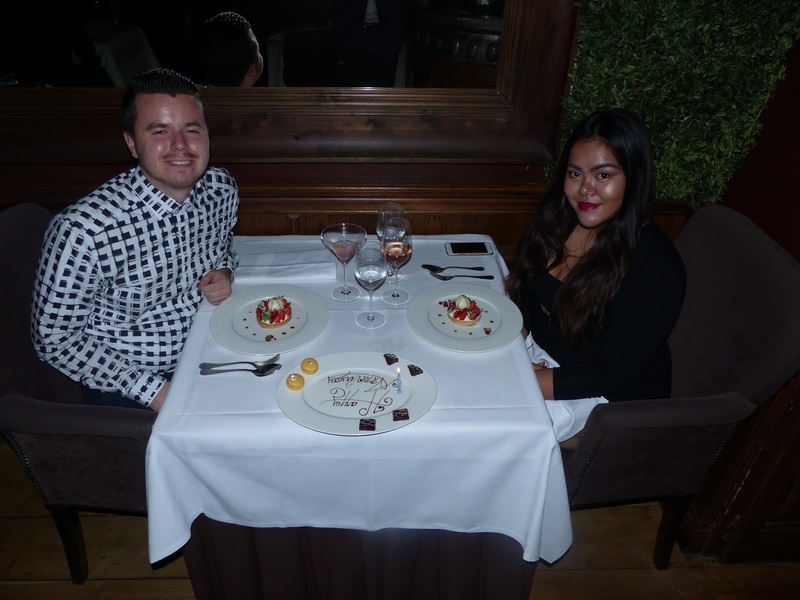 The special occasion was certainly matched by the restaurant and exceptional food we had the pleasure of eating. But wait, that’s not the end! I had mentioned when we booked that we would be celebrating our anniversary, so out came the decorated and complimentary plate of chocolate bites. A special and unexpected touch. Wow!It's mesmerizing. The people in UK who are looking for actual benefits of double glazing and couldn't find any reliable source for it, for them I wanna advice to get agent help.